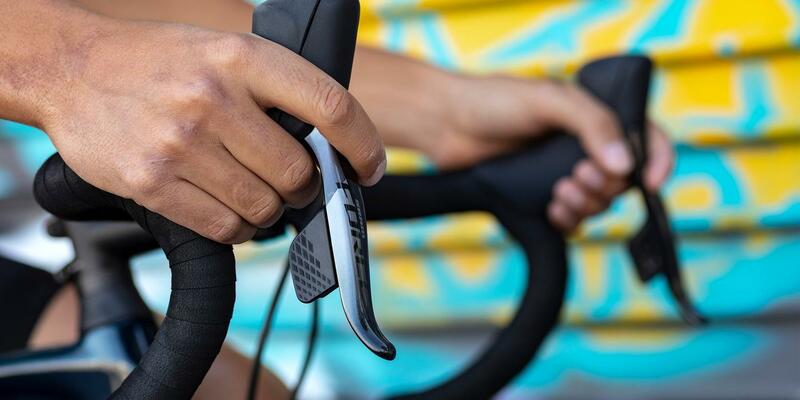 SRAM have launched the latest in their eTap AXS groupset range, with the new Force-level gruppo bringing wireless 12 speed electronic shifting to a more affordable pricepoint. The RED groupset has been an instant success, and the Force is sure to broaden the appeal still further. 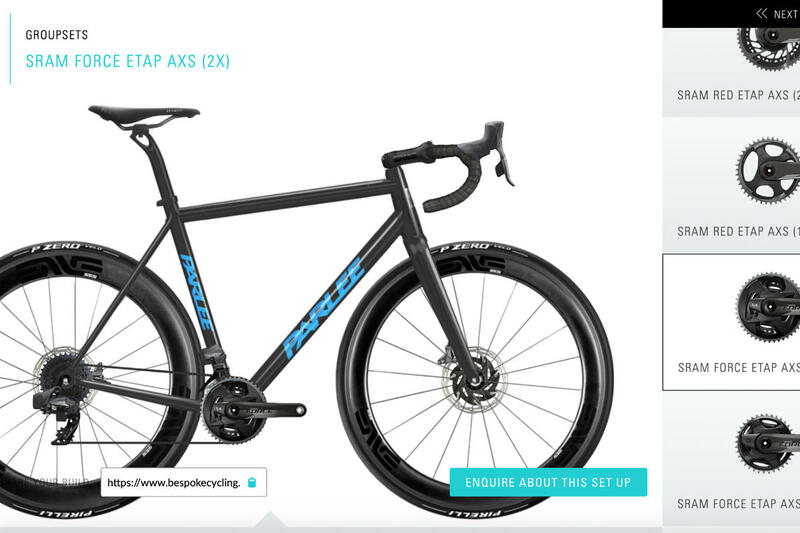 We've already added the new 1x and 2x groupsets to our online interactive Bike Builder - so you can spec up your dream bike with Force AXS. Like its RED big brother, the Force groupset is available in 1x12 or 2x12 configurations, and with hydraulic disc brakes or conventional rim brake calipers. The distinctive "FlatTop" asymmetrical chain is also very much present, lighter and quieter than a conventional design, as is the Orbit fluid damper system in the rear mech. This reduces chain bounce without increasing resistance in the drivetrain as traditional friction clutches can. 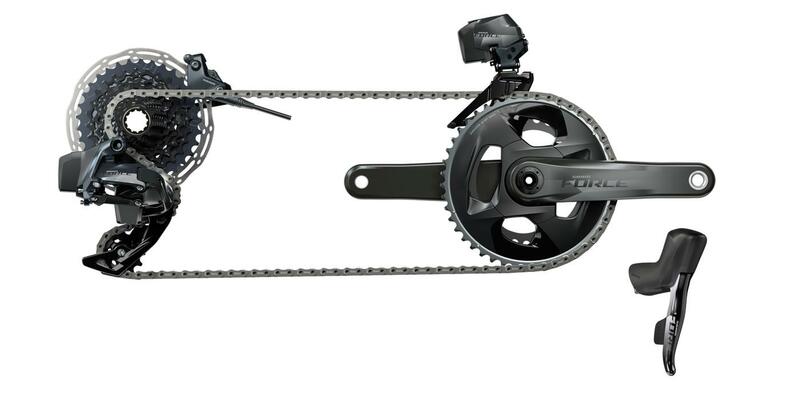 The 1x and 2x chainsets are both available with or without integrated Quarq power meters (and if bought without, can be upgraded later). Also shared with RED is the AXS app which enables you to personalise the setup of the system via your smartphone. Force AXS components are compatible with Eagle AXS too, so this versatile groupset can easily accommodate a dropper post, for example, and can be configured to handle anything from road race to gravel/adventure with ease. All in all you're getting most of the features of the range-topping RED gruppo, and at a significantly lower price. Yes it's a little heavier, a little less luxurious (the cassette in particular has a lot less bling factor, but will still perform brilliantly), but this is very much a state of the art groupset bringing together a whole host of modern tech into a seamless whole. We're already seeing the first complete bikes appearing with Force eTap AXS, in fact Specialized were quick off the blocks with AXS-equipped builds of the Tarmac Pro and Venge Pro (and coming in at the same price as their Di2-equipped siblings). 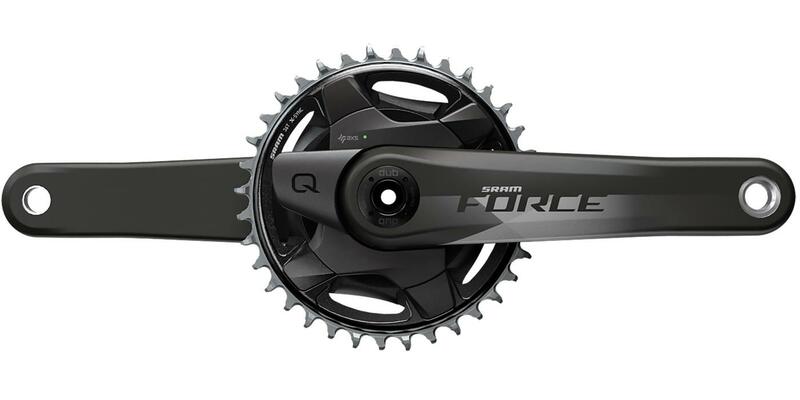 Force AXS will be available soon as a separate groupset, for your existing bike or new custom build. Get in touch or visit us in store to discuss options and to reserve your set now.